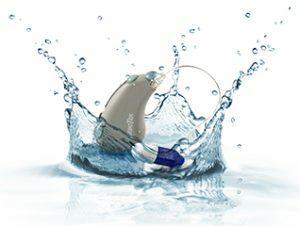 Many hearing aid users have experienced the frustration of having their hearing aids malfunction and become damaged due to moisture and perspiration. The Moisture Protection System (MPS) by SeboTek, incorporates its innovative design, non-corrosive alloys and nano-technology to protect the hearing device. Different from other nano-coating approaches, MPS nano-technology provides superior moisture protection by using a unique application process that treats all external and internal components, including microphones. This special coating protects against moisture, ear-wax, and corrosion so that any kind of liquid that comes into contact with the instrument will simply roll off. This leads to fewer repairs and a better experience. MPS technology employs a special pulsed ionized gas (plasma), which is created within a vacuum chamber, to attach a nanometer-thin polymer layer over all surface areas of the device. During the plasma process, the monomer that we ionize chemically attaches to the surface of the device and all of the components and so becomes part of the material. This way, the treatment will last as long as the material it attaches to, and is not compromised by everyday use. MPS protects against moisture, corrosion, perspiration, cerumen and other possible contaminants, meaning fewer repairs and more satisfied patients. SeboTek’s nano-technology takes the worry out of wearing hearing aids for patients of all lifestyles and activity levels, allowing them to focus on the things that matter most.